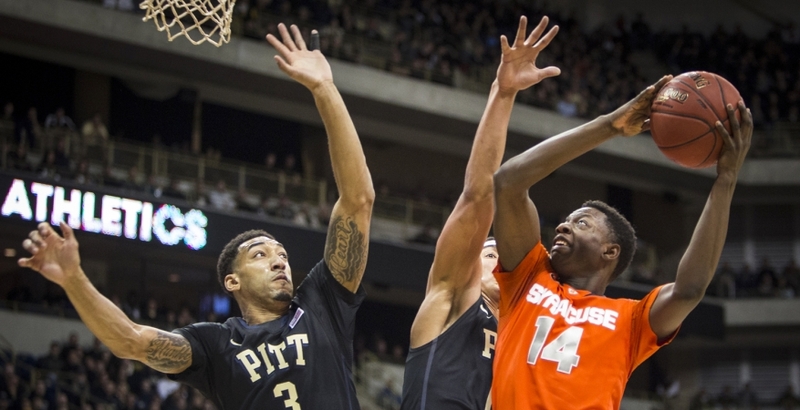 Syracuse Orange Kaleb Joseph attempts a shot during Syracuse's fight against Pitt Saturday Feb. 7. The Orange lost 77-83. Despite a self-imposed post-season ban, SU players can't afford to coast through February. That’s the message head coach Jim Boeheim had on Saturday for the doom-and-gloomers doubting the legitimacy of the Syracuse basketball program, one of the most celebrated in the country over the past decade. Even though the Orange has sputtered through a mediocre season as a fringe NCAA Tournament contender, fans have continued to pack the Carrier Dome and hope for a late-season run. 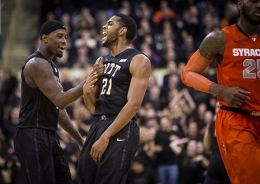 Players of the Pittsburgh Panthers celebrate after beating Syracuse, 83-77. But a self-imposed post-season ban and an ongoing NCAA probe into both academic violations by multiple former student-athletes and cases of improper benefits has cast a noticeable tarnish. The rest of the season, in terms of postseason play, is meaningless, and a number of SU students took to social media last week to vent their frustrations. But does that mean the entire season is now meaningless for Boeheim and his team? Hardly. Spirited efforts during Saturday’s 83-77 loss to Pittsburgh and a 70-56 victory over Boston College on Wednesday were proof that SU isn’t going to cruise through the remainder of its ACC schedule on autopilot. Rakeem Christmas poured in a gutsy 23-point performance against the Panthers, while Michael Gbinije played arguably his best game of the season and recorded an equal 23 points and four steals. On the surface, the Pitt loss was just another blemish in the score column. But look deeper at this game and its context, and you’ll see the Orange had plenty to play for against the Panthers and still does moving forward. Christmas may be the most improved player in college basketball this season thanks to the guidance of assistant coach Mike Hopkins. As he continues to dominate opposing frontcourts with a lethal hook shot and expanded moves in the low post, his NBA Draft stock is trickling into first-round territory. He has proven to be a workhorse all season and delivered double-doubles by the bushel, and his burgeoning professional résumé has to be weighing on his mind, although he would never admit it. Christmas didn’t stray from that path on Saturday, as he played wire-to-wire and anchored SU on both ends of the floor. Then there’s his supporting cast, which essentially is auditioning for a spot on the floor next season. The Orange will welcome one of the country’s best recruiting classes this fall, with four signees in ESPN’s Top 100 rankings. Even ignoring the possible returns of DaJuan Coleman and Chris McCullough, that means playing time will eventually be harder to come by, particularly at power forward and shooting guard. No matter how talented those players may be, SU will ideally want a competent veteran at every position to spell them during any growing pains. For players like B.J. Johnson and Ron Patterson, whom Boeheim has highly criticized at different points during the season, these next few games are crucial for their standing on the team. If Patterson can resist the temptation to shoot threes (which he did against Pitt in 16 minutes of play) and Tyler Roberson can improve his offensive repertoire in the low post, SU can have its most complete team in years. More importantly, it can compete for a championship assuming the NCAA doesn’t ban the program further. But more than anything else, there’s pride on the line. The pride of helping Boeheim inch closer to win No. 1,000. The pride of knocking off a ranked opponent when few outside Central New York expect it. Perhaps most importantly, though, the pride of proving anyone doubting the program wrong.